Whether you already have a cat, are in the process of adding one to your family, or are contemplating becoming a cat owner, these articles will shed some light on various aspects of your furry feline friend's life. From choosing a cat to taking care of its needs on a daily basis to ensure its long-term health and happiness, you'll find practical advice and helpful tips to guide you along the catnip-scented path of being owned by a cat. Come along with us as we discuss the world from a cat's eye view. You'll be glad you did and more importantly so will Sasha the Siamese and Teddy the tabby. 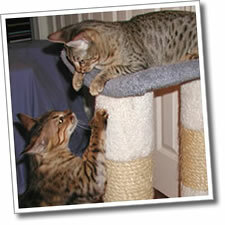 Are you trying to decide whether a cat is the right pet for you? Are you weighing the benefits as well as the actual costs involved? Do you even know where the best places are to find the right cat for you and, if so, do you know how to choose a healthy cat? We'll give you pointers on getting off on the right paw in your search. Do you have any idea on what you should do to prepare for your cat's arrival - what hazardous items to remove from its' surroundings as well as where to locate its' litter box and how to avoid or reduce the associated risk of having your home smell like twelve cats live there instead of just one? We'll be happy to counsel you on making your cat's home a safe and odor-free environment. To help you make your cat's life a healthy one, we'll also be presenting you with important information about how to choose a veterinarian to care for your kitty. We'll also discuss what you should know about spaying and neutering your feline companion, how to keep your cat in top feline physical condition, and the options available to best control and/or eradicate those pesky flea and tick infestations. When it comes time to feeding your cat or kitten, we'll not only cover the basics of what, when, and where, but we'll also review the numerous options for feline food, supplements, and treats. Perhaps more importantly, we'll tell you what items to avoid getting into your cat's system. For those of you brave enough to groom and bathe your cat, something all cat owners should actually do, we'll share some suggestions on how to make such events as productive and safe for all of those involved. If you're wondering why you should even coif your kitty, we'll let you in on the numerous benefits of doing so. For those who are in need of grooming services for their fluffy feline, we'll guide you through the process of finding a qualified groomer to keep your cat's coat in prime condition.